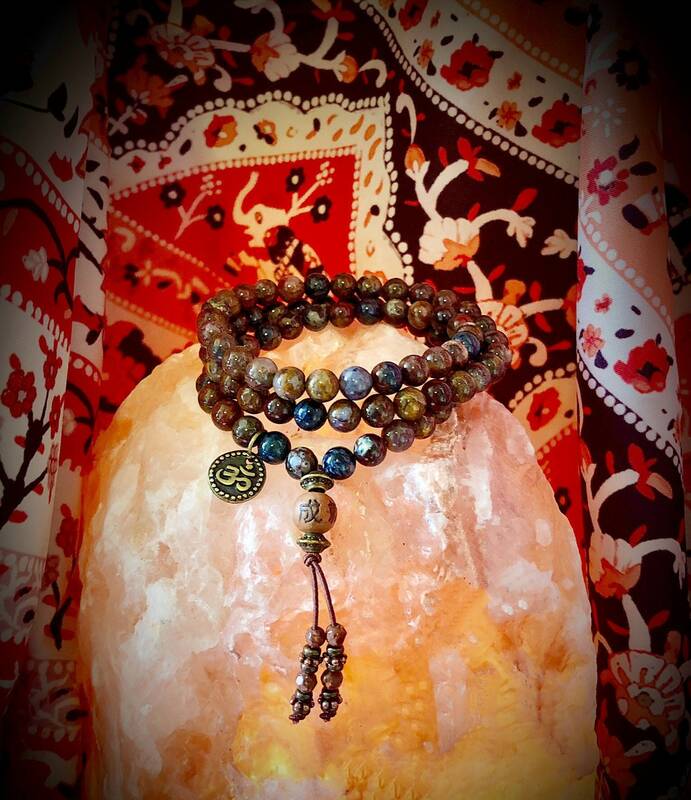 The Soul Mastery Mala Bracelet features AA grade genuine African Pietersite gemstones along with a cedar wood ancient prayer bead and reversible antique brass Om charm to help you form a deep connection with your soul, open your Ajna (third eye) chakra and align you with Source Energy and Divine Intelligence. The mysterious beauty of a storm is captured inside Pietersite, with brilliant flashes of golden light amidst rolling dark clouds of deep blue. Known as the Tempest Stone, it carries an electric charge that is pure magic. 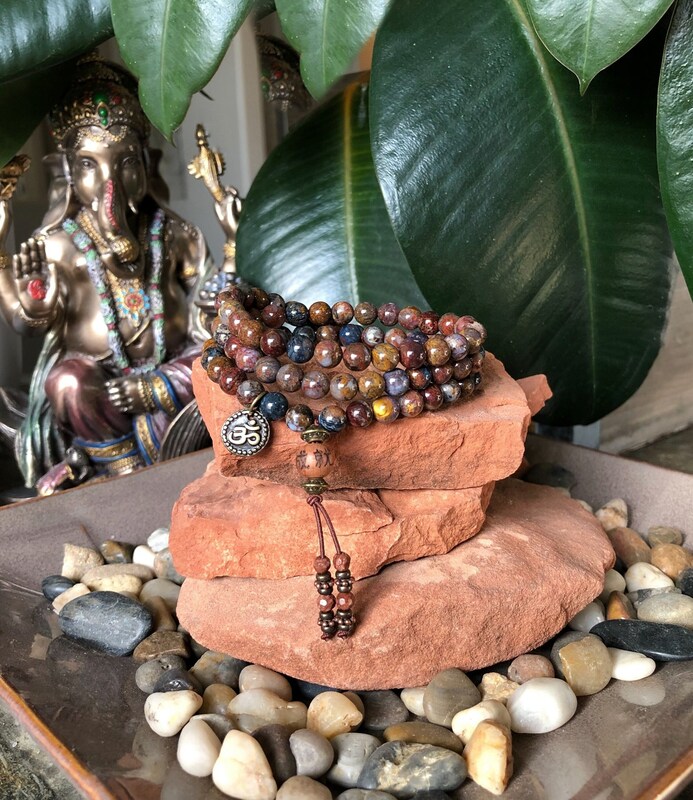 Just as lightning clears the air and makes all things new, Pietersite discharges negative energies and emotional turmoil, cleanses the aura and restores it to calm. It is said to hold the keys to the kingdom of Heaven. 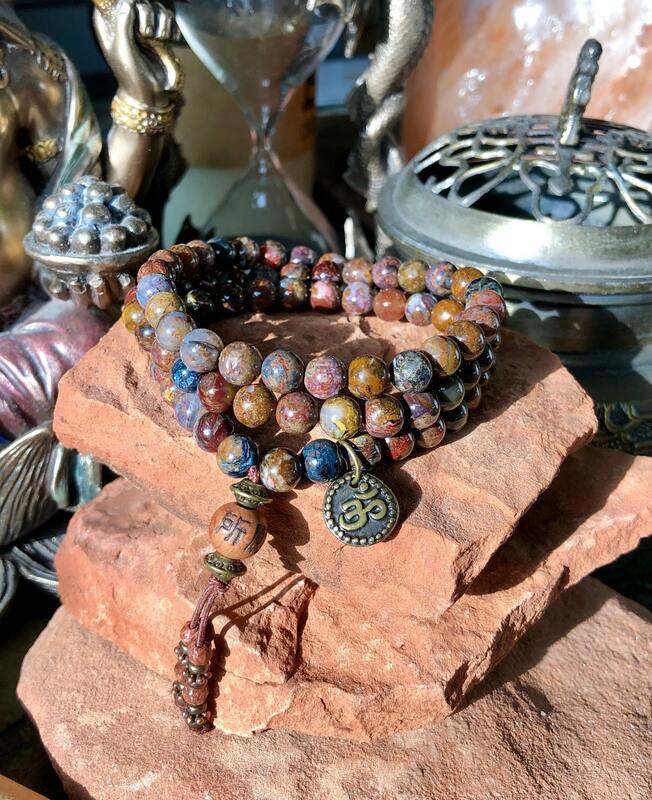 Pietersite has the ability to ground you not only to the earth but also to the etheric body, facilitating spiritual visions, out-of-body experiences, astral travel, telepathic communication and Shamanic journeying. 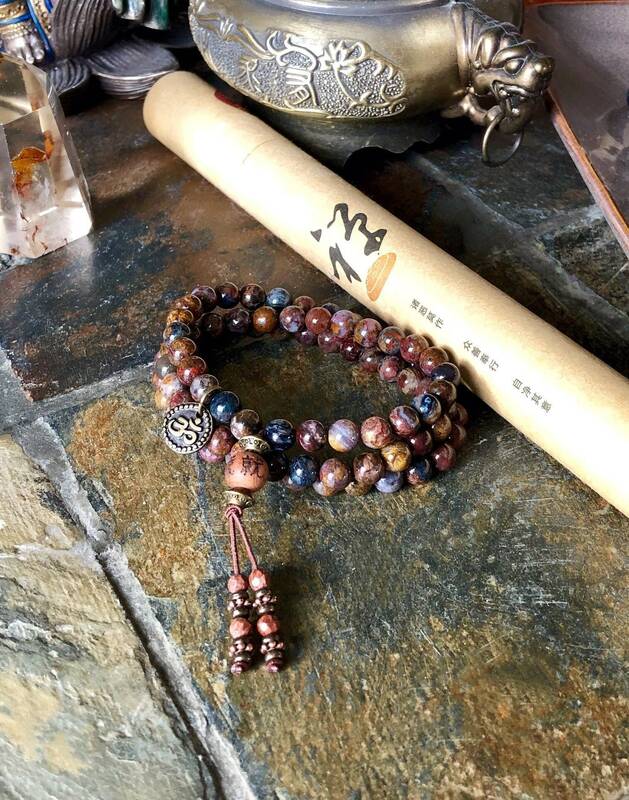 It quickly accesses a very high state of altered awareness, opening the third eye, and may help reveal past life experiences and help you tap into the Akashic Records. It is possible to have profound, life changing spiritual revelations while holding or wearing Pietersite. 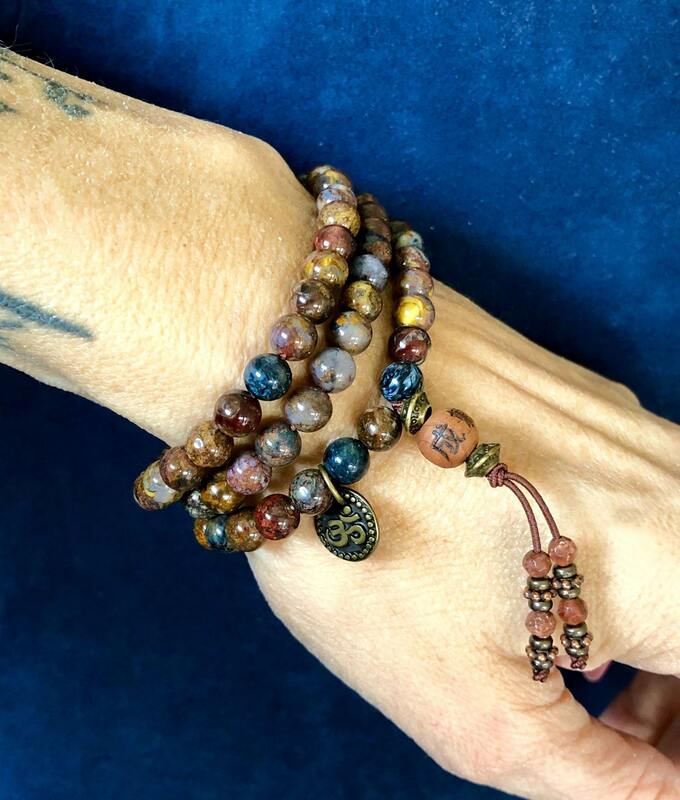 This powerful stone is known for its ability to connect you to your own source, or inner guidance, and help you remember that you are a spiritual being having a temporary human experience. It encourages you live and speak your own truth in this lifetime, as well as recognize the truth or falsehood of other people’s words and actions. 6mm natural gemstones, strung on strong elastic stretch cord. One size fits most. Custom sizing available. *This bracelet will appear dark golden brown indoors in low lighting. When you hold it wear it outside in the sunshine, you will see delicious shades of blue, copper, gold and red. Just beautiful.